To Cite: Yousefi Z, Izadi M, Mousavi Seresht L, Babapour N, Bagheri H. Uterine Arteriovenous Malformation After Molar Pregnancy: A Case Report and Review of Literature, Women Health Bull. 2017 ; 4(4):e12652. doi: 10.5812/whb.12652. Introduction: Uterine arteriovenous malformation (AVM) following molar pregnancy is a rare condition. The present study aimed at reporting a case of uterine arteriovenous malformation after molar pregnancy. 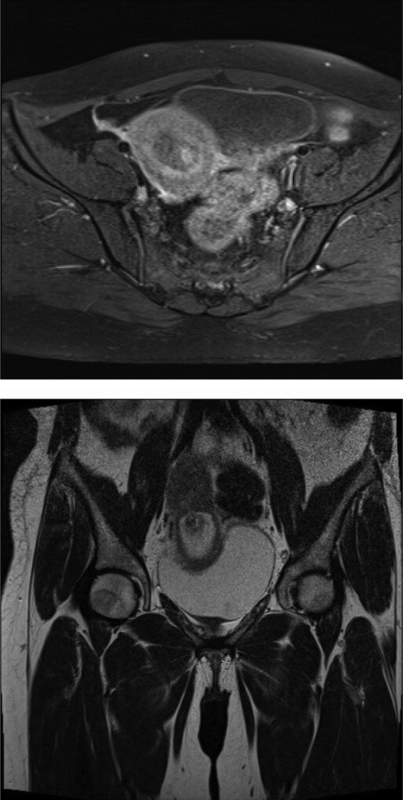 Case Presentation: A 38-year-old woman with repeated heavy vaginal bleeding was referred to oncology department of Ghaem hospital affiliated to Mashhad University of Medical Sciences in 2016. She had history of evacuation curettage of molar pregnancy in the previous month. Examinations revealed AVM in fundus of uterus; and the patients was asymptomatic after embolization of the AVM and she is now under serial follow-up. Conclusions: The diagnosis of AVM should be considered when an unexplained massive hemorrhage occurs after gestational trophoblastic disease. In the case of correct diagnosis, unnecessary surgery is avoided. Uterine arteriovenous malformation is as an abnormal vascular connection of myometrium and it is similar to arteriovenous aneurysm. This lesion is a rare cause of severe and threatened vaginal hemorrhage, especially in women of reproductive age with a history of at least 1 pregnancy. The incidence of AVM is unknown; typically, acquired type of AVM occurs after invasive surgical manipulation of uterus such as cesarean section, dilation and curettage and so on. Also, occasionally AVM is seen in patients without any history of surgery, who have neoplastic disorders (e.g., endometrial adenocarcinoma and gestational trophoblastic disease), or even after normal vaginal delivery (1). The most common symptom of AVM patients is sudden excessive and threatened vaginal bleeding, which is often non-responsive to ordinary treatment and requires blood transfusion. Pregnancy and associated hormonal changes in pregnancy such as elevated human chorionic gonadotropin may play a role in the proliferation of latent AVM through an unclear mechanism. The reports from AVM after molar pregnancy termination are rare. After suspected AVM, imaging studies confirm the diagnosis. The first choice of imaging studies is pelvic sonography, particularly use of Doppler, followed by MRI and angiography. It appears that uterine artery embolization is the most common treatment of AVM although successful result of conservative treatment has also been reported (2). Tsai reported an effective embolization of large molar AVM, which led to successful term pregnancy. When AVM follows gestational trophoblastic neoplasia, angiographic embolization seems to be feasible without damage to future pregnancy (3). 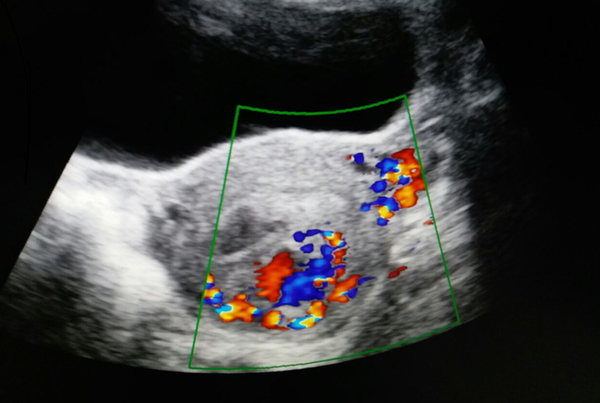 In this report, we discussed a patient with uterine arteriovenous malformation after molar pregnancy. A 38-year-old woman with severe vaginal bleeding was treated with emergency evacuation curettage without any residual disease. She had history of evacuation curettage of molar pregnancy in the previous month. After 3 days of second curettage, she was admitted with threatened vaginal hemorrhage; and after hemodynamic stability, she was referred to oncology department of Ghaem hospital affiliated to Mashhad University of Medical Sciences in 2016. At first, she was given 2 units of packed cell transfusion, and she received the same units of packed cell transfusion again in the second emergency condition. In her history, she had a baby with normal vaginal delivery. In bimanual examination, cervix and uterus appeared normal and serum β-HCG was 8500 mLU/L. The most relevant finding on Doppler ultrasonography was an increased vascularity with multidirectional flow of the uterus (Figure 1). Also, prominent vessel located in the upper posterior wall of fundus suggested AVM. Pelvic MRI investigation illustrates the same diagnosis (Figure 2).The uterine artery angiogram confirmed an AVM in fundus of uterus (Figures 3, 4).Uterine artery embolization was performed with a 5F Cobra catheter (Cook Group Inc. Bloomington, IN), which was placed in the left femoral artery and conducted to inter iliac artery, and then a selective angiography was performed. 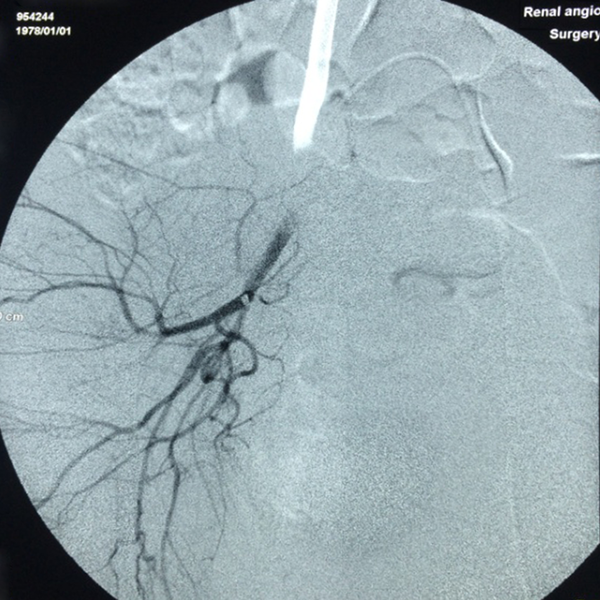 Angiography of super selective right uterine artery of AVM was performed with microcatheter. A 50 mm × 20 cm coil Axiom Helix was put in uterine artery and completed with PUVA355-500 particles (Figure 4). Postoperative angiography revealed complete closed flow in the right uterine artery. The patient was discharged from the hospital within 48 hours after the procedure and she is now asymptomatic and under serial follow-up of 3 months. This paper has been performed according to patient’s informed consent. Diagnosis of acquired uterine arteriovenous malformations as an iatrogenic injury following curettage of molar pregnancy is critical because it is associated with life-threatening vaginal hemorrhage. Uterine artery embolization is a successful treatment option. AVM often occurs in postmenopausal women, but our patient was 38-year old. In a systematic review of 85 AVM cases, the age of most of the patients was approximately 30 years. Mechanism of post-traumatic AVM is not clear although hormonal mechanism, eroding vessels after endometrium trauma, immunologic response, and increase of endothelial growth factor could lead to AVM. Presumably, Inability in regression of proliferated vascular structures of endothelial vessels occurs following molar pregnancy (4). In a case report of uterine AVM after GTN, only 3 patients had an undetectable HCG level at the time of diagnosis. Due to termination of molar pregnancy in the last month, serum B-HCG of our patient was 8500 mLU/L, which was reasonable. The interval from curettage until onset of hemorrhage was 436 days (Ranging 1 to 6570 days). We observed an interval time of 30 days. Uterine artery angiography is a definitive gold standard diagnosis of AVM. This procedure is performed after suspected Doppler ultrasonography, computed tomography, and magnetic resonance imaging. Diagnosis of AVM in this study was performed with all the above modalities. The definitive treatment of uterine AVM is hysterectomy. In addition, coagulation of the uterine vessels and conservative therapy are recommended. Due to the spontaneous regress of AVM, medical therapy and expectant management of uterine AVM may be the possible treatments. Moreover, uterine artery embolization is an effective first-line therapeutic option with fertility preservation and avoids the complications of surgery and anesthesia. However, fertility impairment and unsuccessful pregnancy have been reported as complications of this procedure (5). In addition, incomplete embolization or difficult access to uterine artery may be associated with uncertain results. 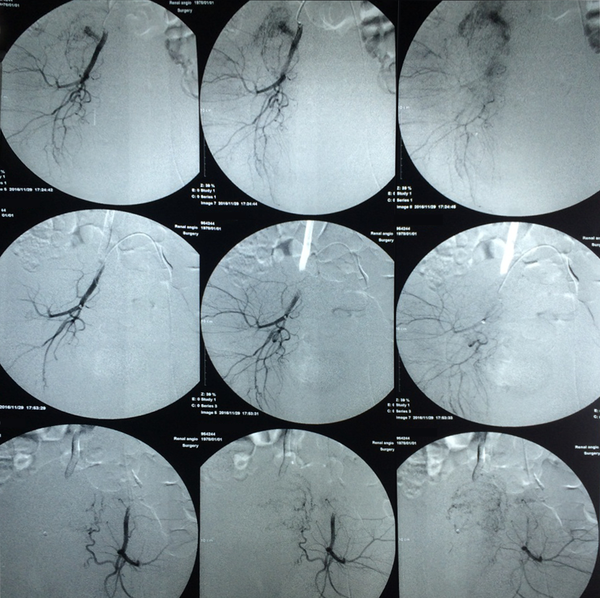 In this case, uterine artery embolization was successfully managed in our patient without any complications. The diagnosis of AVM should be considered when an unexplained massive hemorrhage occurs after gestational trophoblastic disease. In the case of correct diagnosis, unnecessary surgery is avoided.